In a neighborhood with few restaurants, Caffe Nonna offers a much-needed healthy option. Sandra Bradford makes all the food herself. The chances of finding a cup of coffee in deep East Oakland — not to mention a sandwich or a pastry to go with it — are relatively slim. The nearest Starbucks or Peet's is in Alameda or by the airport. So if you're jonesing for a cup of joe, there's only one place to go: Caffe Nonna. 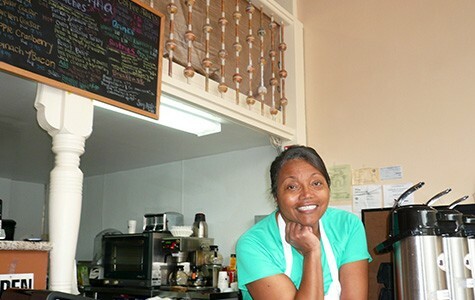 On January 25, Sandra Bradford opened Caffe Nonna on the corner of Bancroft and Fairfax avenues, in one of deep East Oakland's oldest (and perhaps only remaining) commercial districts. Forty years ago, the area was known as "Antique Row" because of its many stores selling furniture, ceramics, and other artifacts from bygone eras, but today, hair salons and barber shops occupy most of the storefronts. There are a few eateries in the area, such as Luis' Coffee Shop, Westbrook's BBQ and Seafood, and Taqueria La Nueva, as well as a smattering of other businesses including a Laundromat, dollar store, botánica, auto repair shop, and a liquor store. This has not been a part of Oakland where you'd find turkey pesto panini or spinach salads — until now. 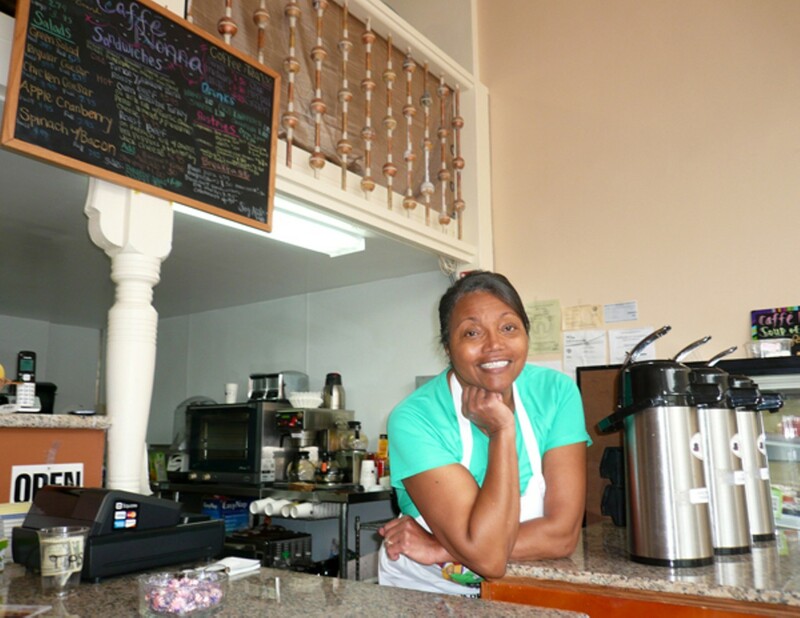 In addition to serving various roasts of coffee, Bradford, who makes all the food herself, also sells sandwiches, soups, salads, and smoothies, as well as fresh-baked cookies, brownies, cakes, and other pastries. It's standard cafe fare, the likes of which you'd find at coffee shops in Berkeley and Oakland's Temescal, Piedmont Avenue, and Lake Merritt neighborhoods — but in East Oakland, where food options are limited, it's one of a kind. "This isn't a real revitalized area," said Bradford, who named the cafe after her grandson's nickname for her. "But there also seemed to be a need that I could fill." With so few real food options in the area, locals are grateful for the new cafe. "When you get the same thing from the same person, after a while, that gets old," said Martin Trahan Jr., who owns the nearby Truly Blessed Hands Barber Shop. "So with [Caffe Nonna], they're adding variety to the whole block." Many who used to eat across the street at Luis' Coffee Shop have switched over to Nonna's. "Luis' was the popping restaurant," recalled local resident Eddie Lee Stewart. "Everyone went there because that's all there was." Stewart, who used to eat regularly at Luis' and other fast-food restaurants, now dines at Bradford's cafe on a daily basis. He swapped his former diet of cheeseburgers and other greasy foods for Bradford's soups and salads, and in less than four months, has lost more than forty pounds. "It really is a blessing," said Stewart, who said he weighed 360 pounds and suffered from gout before he began eating at the cafe. "Healthy food is hard to find, and this is the only place that's close by." Because many of Bradford's customers are trying to eat healthfully, she tries to tailor her menu to their preferences. "I just listen to the people and see what works," she said. For instance, she used to serve an Italian sandwich, but removed it because customers never ordered it. "The people that are coming in here are being health-conscious," she said, which is why, for instance, she only serves turkey, tuna, and roast beef sandwiches. She includes ingredients such as strawberries, cranberries, and walnuts in her salads, and she uses broth, rather than cream, as a base in most of her soups. The green smoothie, which Bradford makes with kale and plenty of fruits and vegetables, is one of the most commonly ordered items on the menu. Kem Simmons, a hairdresser at the salon next door, said she drinks one every morning for breakfast, and, according to Bradford, one customer even claimed that the smoothie helped her get over the flu. In fact, many of Bradford's customers had never tried raw kale before, let alone drank it. "It was a first time for me," said Stewart, who has become a spokesman of sorts for the smoothie. "I see a lot of people coming in that's obese and from lots of different nationalities, and they buy the smoothies, too." But the most popular items at Caffe Nonna are the baked goods. The selection changes daily but can include banana coffee cake, buttermilk pound cake, cookies, brownies, apple turnovers, lemon blueberry bread, and cupcakes. Bradford, who has been a baker for decades, used to sell her treats at neighborhood events, such as the Laurel Street Fair, and had even considered opening a bakery instead of a coffee shop at one point. When she first opened Caffe Nonna, the local neighborhood watch group mentioned her cafe in their newsletter, and word-of-mouth helped the business grow. Bradford is grateful for the boost local residents and shop owners have given her business. "The first day, most of the shops around here and the people in the neighborhood came through," she said. "They were really supportive and I can't complain. Historically, most new businesses in the tiny commercial district have failed, but Caffe Nonna, Bradford hopes, will be the exception. "I took a huge risk opening up here," she said, "but I'm a glutton for challenge [and] I'm still growing." Black-market alcoholic drinks, advertised on Instagram and often sold out of garages, are becoming increasingly popular in Oakland and throughout Northern California. A once bustling business district in East Oakland is finally coming back to life.